A three year old Great Dane named Major is in the running for recognition by the Guinness Book of World Records as the tallest dog in the world. 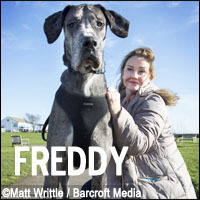 He stands over 7 feet tall on his hind legs and and 4 foot 3 from paw to shoulder and weighs 168 pounds (17 stone). 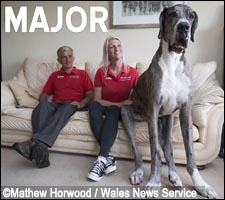 Major and his owners Julie and Brian Williams from south Wales, England will find out next month but there is competition. 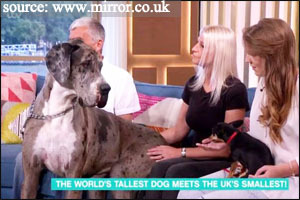 Two other Great Danes measure over 7 feet tall – four year old Freddy from Essex, England and two year old Rocko from Nevada. According to his owners owners Julie and Brian Williams, Major goes through half a dozen eggs in the morning and can eat up to the equivalent of four and a half pounds of meat in the evening. At nearly four years old, he has not stopped growing, though should top out some time later this year. 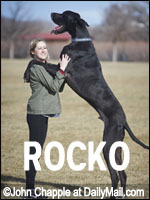 Giant George, a Great Dane from Arizona, was the Guinness Book of World Records Tallest dog from 2010-2012. He passed away in 2013 and lived to be almost eight years old. George made appearances on many TV shows such as The Oprah Winfrey Show, Good Morning America, The Today Show, Regis and Kelley, Animal Planet, and many more. He measured 43 inches at the shoulder, 7’3″ long, nose to tail and weighed 245 lbs. 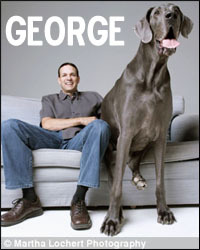 He even had his own website and a book Giant George: Life with the World’s Biggest Dog. As big as he was though, “Giant George” was supposedly terrified of Chihuahas! Before that, a Great Dane from Otsego, Michigan named Zeus held the title. He stood 44 inches tall and was 7’4″ on his hind legs. Zeus died in September 2010 just before his 6th birthday. Knowing my penchant for having small breed dogs in my household, I am amazed at how a family can accommodate such a canine behemoth. All my Chihuahuas could probably fit in the back pocket of someone like Major – well that is if dogs could wear pants. 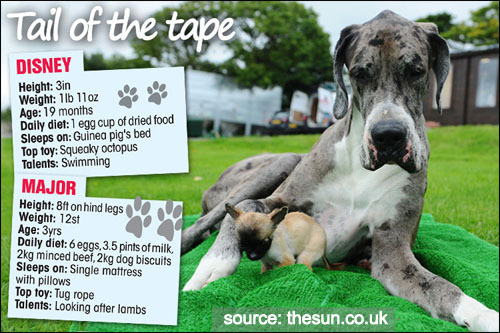 So it darling to see such immense dogs pictured along side their tiny companion. In fact Major’s new best buddy is a little Chihuahua named Disney who measures just three inches tall. Disney weighs just 27 ounces and eats only 1 egg and a cup of dried food a day. You can see the video of them together here. Major has also made appearances with other diminutive stars. Here he is with a dwarf dachshund named “Chip” who is in the running to be named the World’s Smallest Dog and weighs only 900g. The two met on camera during a taping of ITV’s Good Morning show. Here’s a 2007 video from Guinness’ archive featuring Gibson and a toy Chihuahua named Boo Boo.